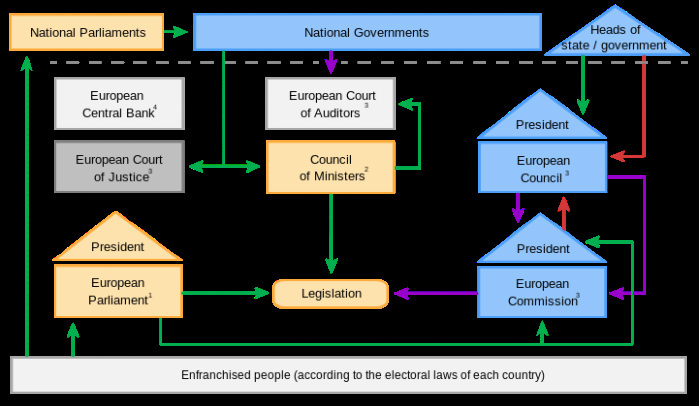 The European Union (EU) is governed by seven institutions. Article 13 of the Treaty on European Union lists them in the following order: the European Parliament - the European Council - the Council of the European Union (simply called "Council") - the European Commission - the Court of Auditors - the Court of Justice of the European Union - the European Central Bank. Most EU institutions were created with the establishment of the European Coal and Steel Community (ECSC) in the 1950s. Much change since then has been in the context the shifting of the power balance away from the Council and towards the Parliament. The role of the Commission has often been to mediate between the two or tip the balance. However the Commission is becoming more accountable to the Parliament: in 1999 it forced the resignation of the Santer Commission and forced a reshuffle of the proposed Barroso Commission in 2004. The development of the institutions, with incremental changes from treaties and agreements, is testament to the evolution of the Union's structures without one clear "master plan". During the negotiations, two supervisory institutions were put forward to counterbalance the power of the High Authority. The "Common Assembly" proposed by Jean Monnet to act as a monitor, counterweight and to add democratic legitimacy was composed of 78 national parliamentarians. The second was the Council of Ministers, pushed by the smaller states also to add an intergovernmental element and harmonise national polices with those of the authority. Political institutions There are three political institutions which hold the executive and legislative power of the Union. The Council represents governments, the Parliament represents citizens and the Commission represents the European interest. Essentially, the Council, Parliament or another party place a request for legislation to the Commission. The Commission then drafts this and presents it to the Parliament and Council, where in most cases both must give their assent. Although the exact nature of this depends upon the legislative procedure in use, once it is approved and signed by both bodies it becomes law. The Commission's duty is to ensure it is implemented by dealing with the day-to-day running of the Union and taking others to Court if they fail to comply.